Mackinaw City Fishing Charters: Mackinaw City offers excellent fishing opportunities from mid to late summer. Atlantic Salmon, King Salmon, Steelhead, and Lake Trout are commonly found near the Mackinaw Bridge, Mackinaw Island, and underwater structure near Mackinaw City. 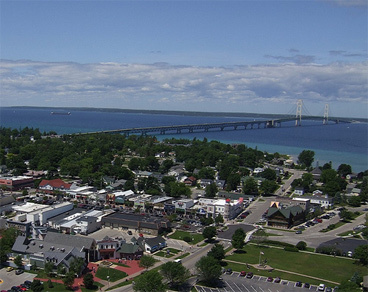 Arrangements can be made for clients to be dropped off on Mackinaw Island after fishing, and Mackinaw City features an excellent fish market to smoke and/or freeze fish for customers traveling home.